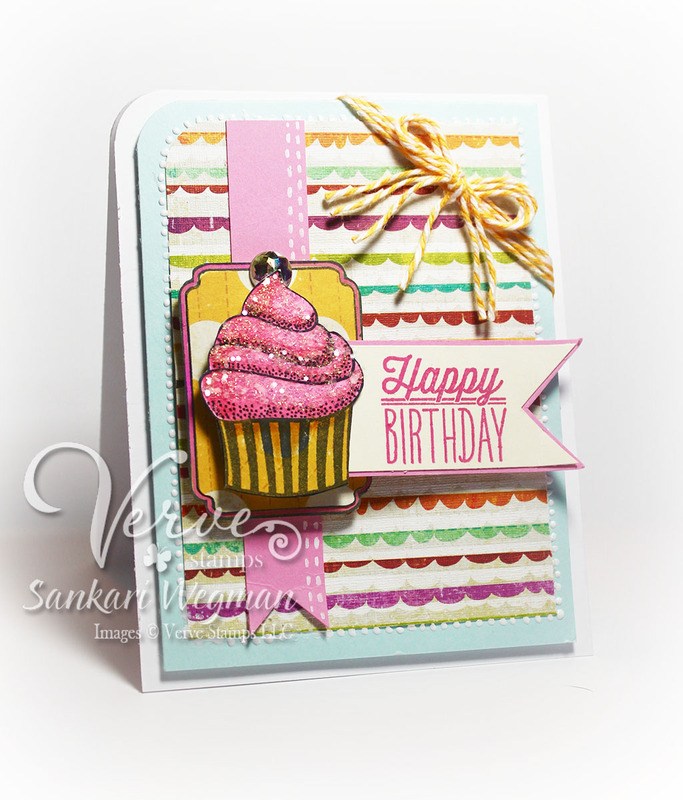 Sankari's Sunshine Corner: April Verve Diva Inspiration Hop: Happy Birthday! Guess what time it is? It's time for Verve's monthly Diva Inspirations Challenge and Blog Hop! There are TWO $30 gift vouchers to the Verve store up for grabs this month and two ways to win! First, comment on the design team's blog hop posts (linked below) for an entry in the first giveaway. Then to be entered into our challenge prize drawing, go get inky and link up your take on the challenge. You have until May 5 to link up. Feel free to play along with the challenge as many times as you like. Verve stamps aren't required to play, but we do smile a little brighter when we see them! A little tropical flair is in the air for inspiration this month. Bright pinks, aquas, golden tones and a touch of white promise easy breezy days ahead. There's no script for this inspiration... go floral, keep it modern, follow our color pattern or forge your own path, just show us your tropical chic inspired creations. 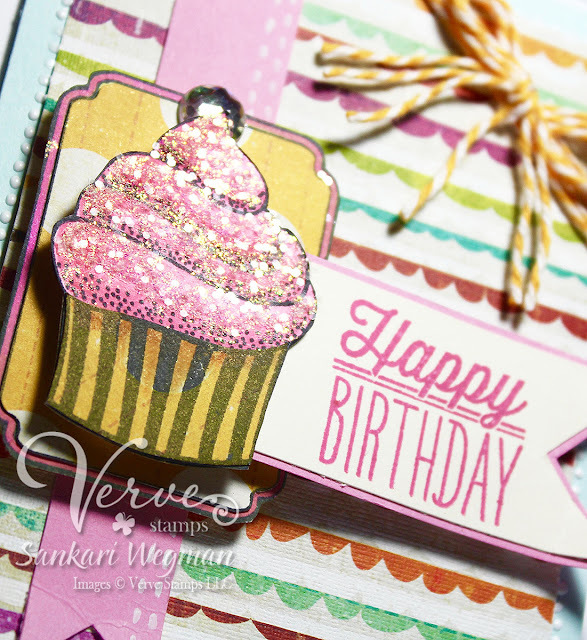 Here is a closer peek at the cucpake - I love this cupcake - it is so much fun to color and also to "ice" - I added stickles to the whole cupcake and some chunky glitter to the non-shadow part for more texture :) - Love how this turned out! Loved makin this fun card and hope that you have a chance to play along with this challenge - just link up to the Inlinkz provided!! Not only is it so much fun to play along - but there is also a chance to win some sweet Verve! What a fun cupcake, Sankari!! Love the rhinestone cherry on top - beautiful image! Lovely birthday card, great design! Thanks for sharing. Super card! The cupcake looks good enough to eat, and I love the twine in the corner! So clever! What a sweet card. Love the yummy looking cupcake. Great use of the colors in your design. What a fantastic, fun, glittery cupcake. Love the dimension and sparkle of this card. The layers are awesome and you did a great job using the colors theme. WOW! Love the sparkles on your cupcake! Absolutely gorgeous and elegant! Hi Sankari! I'm in love with your sparkly cupcake! The frosting looks fantastic with all the shimmer and shine. This is such a fun and fresh looking birthday card, love it! Thanks for sharing your fun birthday card. LoVe your sparkly cupcake. Oh wow, your cupcake looks delicious!!! And such a pretty card to go with it. lol Beautiful! That cupcake is just sensational, Sankari! Love, love, love the sparkle and all your fabulous details on this scrumptious card. Very cute cupcake card--I like all the sparkle. Your card is so bright and uplifting. I just love the fab cake with its frosting. Uber sweet and sparkly card! That is the most delish looking paper cupcake I have ever seen! This card has party all over it! Love the sparkle and fun background! Yummy cupcake! What a wonderfully sparkly cupcake!! Fabulous card!! This is so much fun, Sankari. You really did a great job, and helped get my creative juices flowing. I had so much fun on the blog hop, and in creating my card for this challenge. Thanks again for inspiring us all with your fun card using this fun color combo. Love all your fun & sparkly details! Love the sparkly cupcake. Delicious card. I love the sparkly cupcake! Delicious card.